Ships That Go Bump In The Night. It is the middle of the night and all is quiet. Routine on a naval ship is the normality; the routine in the small hours of the night is even more crucial, because that’s the time when people are at their least aware. It’s nature: humans are better asleep in the depths of the night. Standing around in the dark is simply not as interesting as standing around during the daytime. Even at sea, there are things to see in the daylight, like a seagull. At least there is something; when it’s dark, it’s just one fug of nothingness. The blackness becomes boring for the rating standing lookout on the bridge of the USS Porter. That’s when he’s shaken into life when he sees the red light that signifies the port side of a ship. It’s a tanker. Actually, there are two red lights which stands as a warning to other ships. Lights don’t switch themselves on, not at least this kind. Someone on the tanker must have known that the USS Porter was there. The Porter’s bridge is an anthill of panic. The Porter had already taken evasive action from the path of another cargo ship, turning out of its way… and they’d not seen the tanker. I have to remind you at this point that the radar systems of the USS Porter can pick up a floating coke can at three miles and here’s a ship that’s twice the size of an aircraft carrier and it’s about to ram them. Well, that’s what lookouts are there for: just in case the systems fail. Which is precisely what happened here. The damage to the starboard side of the USS Porter. Wikipedia. Maritime law has something to say on this issue, though. Even the most casual of sailors (me) knows that someone who is on your starboard side has right of way. The USS Porter had just turned to the left and into the tanker’s path. The tanker was on the Porter’s starboard side, meaning that the Porter had broken the first and most important maritime rule. The resulting collision was deemed to be the Porter’s fault. The US government had to pay to repaint the tanker as well as their precious warship. The Porter’s captain was relieved of his charge. Okay, fast forward to a month ago. It’s the depths of the night and a naval warship is going about its routine duties. For even the youngest sailor of the deck watch, this will be routine: it’s happened so often that you just can’t imagine anything else. The clock ticks, time passes and nothing happens. It’s what the deck watch is all about: trying not to be bored when nothing’s happening and the seconds are passing like minutes … and you’re on duty for another two hours. 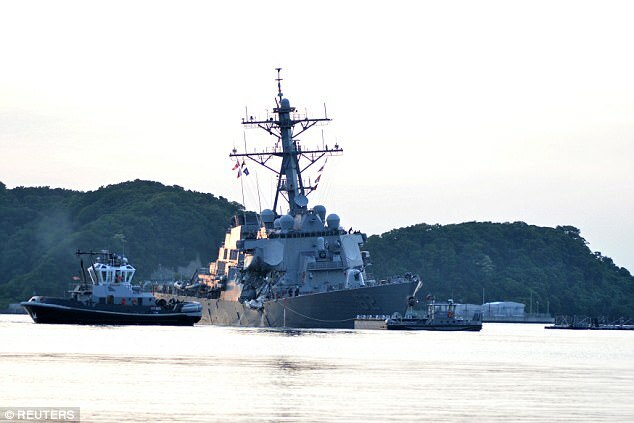 USS Fitzgerald after the collision. Note that the damage is within a metre of the other collision, and had a devastating impact on the electronics. Source:Reuters. Defense officials told CNN and Reuters that the early results of the investigation show that the Fitzgerald was at fault, and that a loss of situational awareness was a primary factor in the collision. “There was not a lot that went right leading up to the crash. There were a string of errors, but they did a lot after the collision to save lives and the ship,” an official with knowledge of the inquiry told Reuters. The story telling us why USS Fitzgerald turned left into the path of a huge container ship has yet to be published. The truth of the matter is something we’ll never know, if for the only reason that people who tamper with computer systems are not going to tell you how they do it. Naval historians recall possibly the last time a warship was hit by a larger vessel in peacetime was in 1964 off the coast of Australia’s New South Wales. What struck me was the commonalities between the two accidents. Both ships made manoeuvres that were both contrary to the law of the sea and contrary to common sense. The Daily Mail quoted Stephan Watkins, a Jane’s expert, that the Crystal had blindsided the Fitzgerald. Quite how a lumbering container ship that needs two miles just to turn a corner can blindside a nimble destroyer with the best radars on the planet is still open for discussion. No doubt the readers of the Daily Mail will believe it simply because it’s in print, but that’s the subtlety of the kind of propaganda that saw Jack the Ripper shoot into international stardom. In the same newspaper. It’s what the readers want to believe, and believing what one wants to believe is very dangerous, as we will come to see. What’s puzzling is that nobody suggested that the tanker had blindsided the USS Porter; perhaps the journalists simply didn’t think of it? Either way, both ships have remarkably similar damage; the point of impact in both cases was within a metre or so. In both cases the radar systems were put out of action, even the USS Porter had to use a satellite phone to contact their superiors. And the Porter’s damage was substantially less than that of the Fitzgerald. None of which is important. For those of you who have thought ahead of me, you’ll have realized the importance of what actually occurred. Two warships were put out of action for several years while they were being repaired. What’s more, there are a lot of container ships out there. Quite how the American’s Aegis systems failed to detect these enormous ships has yet to be fully buried. That both destroyers also turned to port (their left, in terms of the direction they were sailing) and into the path of an incoming ship is less easy to cover up. Saying that the last accident of this kind happened in 1964 does help deflect from the problem at hand. The report found numerous safety, operational, personnel, and command problems in the submarine. The problems included the captain’s failure to communicate a plan for crossing the strait, poor contact management, a lax command attitude, and a failure to correct watchstanders who were known to sleep on duty. At the time of the collision, the navigator was listening to an iPod in the wardroom. Furthermore, the captain was never present in the control room at any time during the crossing of the strait. Perhaps he’d put his vessel onto automatic pilot? Oh, and this was in 2009. The USS Hartford was back in service two years later. She was in port between April 2009 and Feb 2011, costing $100 million to repair. This isn’t about expense, though. America can print money to its hearts content and when there’s a problem with the amount of debt they can borrow, Congress simply votes that they can borrow more. Only… isn’t that the same kind of thinking that led the navigation officer to sit in the ward room rather than do his job? He didn’t need to be on the bridge because he had long experience of knowing that his superiors were sitting in the wardroom with the ship on automatic pilot. Discipline in an organization as large and diverse as the US Navy takes years to dispel. Sorry, establish. No! The problem is made worse by the kinds of propaganda the US excels in: “we’re the best”. It’s what they all want to believe. If the US Navy IS the best, why bother with the routine details? But then, two ageing SU-24s doing a dummy missile run on a stricken destroyer had ten percent of its crew asking to be relieved from active duty. Propaganda undermines a person’s ability to deal with reality. This might seem an odd thing to bring up, but any of you who listened on short-wave will know the sound of Radio Moscow’s call signal. Now this was also broadcast at a frequency of 10.7MHz, which is an internationally agreed frequency for all heterodyne receivers – I’ll not go into detail, suffice it to say that it is an integral part of all radios, even digital ones. Only the short wave radios had the sensitivity to pick up this tiny signal, hence only short wave enthusiasts – otherwise known as bored students – would ever get to hear it. The point being that the signal was tiny, the radio itself did the rest for the Soviets. It was illegal, but that’s not the point. Imagine now that the Aegis system uses a similar frequency somewhere in its makeup? Imagine now that someone comes along and floods that frequency with a modest level of interference. The Aegis system will do what it’s supposed to do: amplify that signal. How can a system know that it’s amplifying interference? Just at the point when someone else is amplifying a signal to tell the ship to turn to its left. The result was two warships in dock for two years. You can’t win a war with warships that are in dock because a container ship ran into them, can you? As a fellow blogger told me, “if you wish to challenge that you’ll never be put in a position to do so.” Isn’t that how corruption becomes part of the norm in a system? But then, the American’s way of doing things is to tell everybody else to get out of their way. It’s worked this far, why change anything? Previous Post The Parachute Regiment’s Day Out. Next Post Piet Mondriaan: Mill In The Sunlight 1908. “Collisions like these are extremely rare and two in one summer, both from 7th Fleet based in Japan, is stunning,” said David Larter, a US navy veteran and naval warfare writer. He added it was far too early to assess what caused the McCain to collide. “The number of breakdowns that have to occur for something like this to happen make them a rare occurrence. Sailors monitor radars round the clock, they have multiple sailors standing watch on the bridge which also has a radar, and they have at least one lookout posted at the back end of the ship to watch for exactly these kinds of situations,” he said. It has to be asked why it happens at all, leave alone three times in the space of a decade or so.